The LED series has been upgraded to a different design a little larger frame, powder coated an ready for shipping. They are coming off production an there may be a couple days lead time if sells volume increase to fast compare to production. .
A very simple and quick way to increase your refrigerator cooling, simply install a add-on evaporator fins fan to any model with the Special LED accent light, 2 toggle switches to turn on fan or LED light separate. We have mainly sold this Deluxe LED fan through our web site. We have sold over 4000's this year of the Deluxe Fans, we are making it available now through eBay. For every cooling unit sold through our web site, the customer is adding a evaporator circulation fan to their order. This unit does not have to be wired to the interior light since not all Norcold have a usable interior usable light, but can if you confirm refrigerator has DC power to light at all times when the door switch pushed. Why take a chance mis-wiring to damage PC Board controlled light DC power slide the fan wire through the drain tube to make a DC connection on the back side. Take a look at the picture to compare fan size of OUR fans: compared to Competiors small fans.Why pay for something an not get, like larger fan for better air flow for max cooling ability, independantON-OFF switches so you can control fam or LED light without removing fan as one competitors states or turn off refrigerator. What if you want to keep fan running just to vent for drying out the insides before putting up for storage. Heavy gauge Aluminum frame with Stainless Steel cable, push on clips for mounting plus a metal grill for keeping the fingers out. Fans fits any RV Brand or Model, with or without DC power to Refrigerator from a small single door to the large side by sides. A very low amp draw, 0.1amp . With some models this Fan wiring was designed to be a Plug n Play install. Some of the newer Refrigerators in RV's do not have the light for the quick hook up, so we have designed the fan to be wired either to light or to any 12 vdc source without any fan modifying. It will come with all terminals needed, so you can wire as needed. 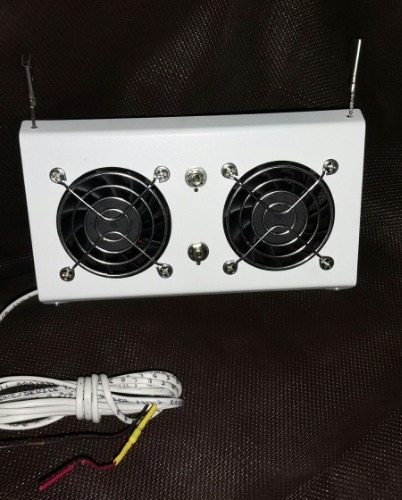 Great safety feature with this add-on fan, from others of this style, it does not have to be wired to the interior light, which has an inline fuse to prevent, if fan shorts out burning up your PC board of most RV refrigerator used. This Dual Fan frame is same color as the inside Evaporator Fins giving a more attractive inside from having odd stand out color fans like competitors. The fan is not the standard small fan used by competitors, check out the size. Notice the LARGER blades, so the high RPM can move more air without the high amp draw or load to move a large blade. It's like the Turbines of a Jet Engine. The cable not only is used to mount, it is also used as Vibration Damper with stainless steel push on grounding clips. The electrical wire is about 72 inches long giving you enough to work with, not only is the wires long, it's doubled and protected in a sleeve. If at any time more details are needed, send me your questions. If any wiring help is needed, send me your request.